In honor of Earth Day, The Indiana Department of Transportation (INDOT) announces new paving specifications that allow for additional use of recycled materials. By increasing the amount of reclaimed asphalt pavement and recycled roofing shingles within asphalt mixes, INDOT anticipates it can save $10 to $15 million on annual paving expenses. Both reclaimed asphalt and roofing shingles contain some of the same liquid asphalt and crushed stone content used in virgin asphalt pavement. INDOT previously allowed a limited amount of reclaimed asphalt pavement and new roofing shingles discarded at the factory to be included in hot mix asphalt. Starting this April, INDOT contractors can use an increased amount of these materials, as well as post-consumer shingles torn off existing roofs. Recycled materials are tested to make sure the overall asphalt mix meets or exceeds standards for safety, durability and longevity set by the American Society of Testing Materials and the American Association of State Highway and Transportation Officials. Because liquid asphalt is a petroleum-based product, the change also reduces Indiana’s dependency upon imported crude oil. Reclaimed asphalt pavement and post-consumer roofing shingles are on a growing list of recycled materials finding their way into Hoosier roadways. Most of the concrete and asphalt pavement removed during Indiana road resurfacing and rebuilding projects is reused for the roadway infrastructure, rather than being hauled to a landfill. For example, old concrete can be crushed up and used to build a new road’s sub-base while asphalt millings are often compacted along the pavement edge to form the soft shoulder. Waste byproducts from Indiana’s steel and coal industries, known as slag, have been used within asphalt mixes for a number of years to provide structural support. These materials take the place of aggregate that would otherwise be mined out of the ground at a nearby quarry and then trucked in to the construction site. As research in this field continues, INDOT hopes to make increasing use of recycled paving materials in the future. 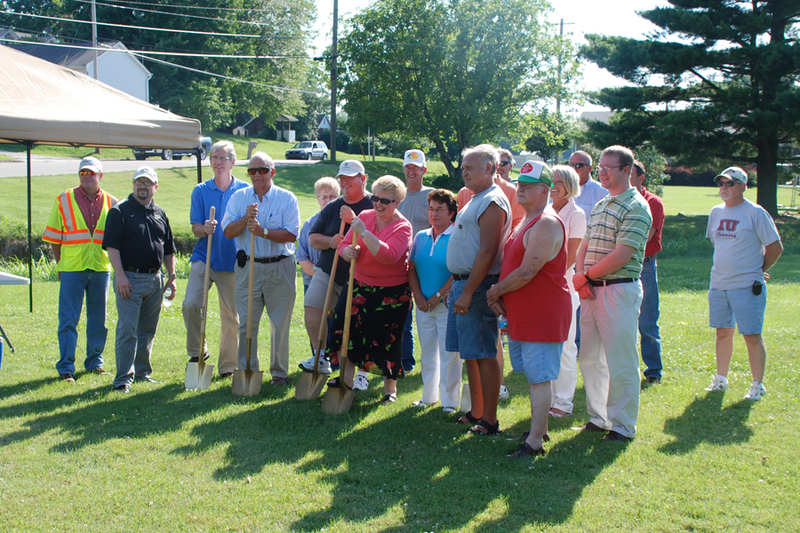 Tell City Mayor Barbara Ewing along with local elected officials and residents living along Pestalozzi Street in Tell City gathered for a ground breaking ceremony to mark the beginning of a long awaited drainage correction project. Representatives from J.H. Rudolph were on-hand to answer questions and let residents know details about the construction phase. You are currently browsing the J.H. Rudolph and Co., Inc. blog archives for July, 2010.